A record number of degree applications was received for the spring ceremony—2,820 total—making it the largest commencement in Wright State history. 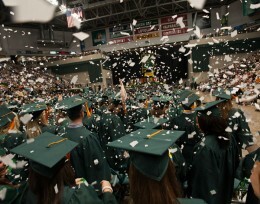 As Finals Week winded down at Wright State, the university readied its Nutter Center for the largest commencement in its 44-year history. The 2012 Spring commencement ceremony took place June 9 at 10 a.m.
With many students pushing themselves to graduate before next fall’s semester transition, a record number of degree applications were received for the spring ceremony—2,820 total: 1,888 bachelor’s degrees, 834 master’s degrees, 71 associate degrees and 27 doctorates. Included in the class of 2012 are 128 international students from 27 nations. The class also included 64 Hispanic students, 85 Asian American students and 228 African American students. The graduating class had 1,583 women and 1,237 men. The youngest graduate was 19 and the oldest was 72. Forty-six high-achieving students earned a perfect 4.0 GPA. Miller embarked on his degree-collecting quest at Wright State in 2000 at the age of 60 . Tom Miller will collect six bachelor’s degrees—political science, international studies, liberal studies, modern languages, anthropology and geography—when he takes the stage at commencement. A retired Air Force officer, the 72-year-old already has bachelor’s and master’s degrees in aerospace engineering. 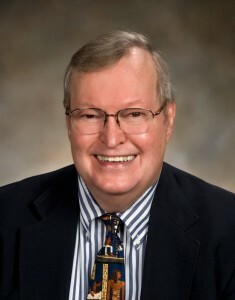 Miller embarked on his degree-collecting quest at Wright State in 2000 at the age of 60 as part of the Senior Scholars program. Although Miller pursued multiple degrees at the same time and completed work toward them at different times, university regulations would have made it difficult for him to collect the degrees one at a time. With an IQ once estimated as high as 203, Miller is in the top 1 percent of duplicate bridge players on the planet and is a formidable backgammon player. He won the chess championships at Wright-Patterson Air Force Base all 10 times he competed. “Whenever I’m at parties and they play Trivial Pursuit, it’s always Tom versus the room,” Miller cracked. Before coming to Wright State, Dufour served on Air Force One as one of four nurses assigned to President George W. Bush and as sole nurse to Vice President Joe Biden. Air Force Major Karey Dufour will become the first graduate of the Flight and Disaster Nursing specialization in the Clinical Nurse Specialist program. The specialization prepares nurses to manage critical care patients in the unstructured environments of air transport and crisis. Students in the program, run by the College of Nursing and Health, take hands-on disaster preparedness courses at Wright State’s Ohio Center of Excellence, Calamityville, the National Center for Medical Readiness Tactical Laboratory. There they can practice caring for patients in a variety of situations from natural disasters to terrorism and combat. Before coming to Wright State, Dufour served as one of four nurses assigned to President George W. Bush and as a sole nurse to Vice President Joe Biden. 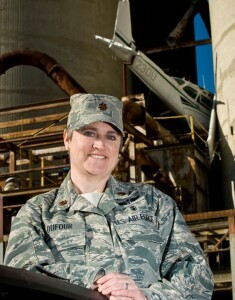 Her experience was an asset to the fledgling program. After arriving at Wright State, Holler decided to use his experience as a person with a disability to shoot for a degree in rehabilitation. After his third year at Wright State, he moved from home into the dorms, a huge step for someone with his disability. Zach Holler carries a 3.78 grade point average while holding a part-time job. He interned with a federal disabilities agency in Washington, D.C., conducting research for the commissioner. He is president of a campus group striving to unify students and students with disabilities. And Holler does it all from a wheelchair, where he deals with a genetic condition that has left him with greatly limited mobility and severely visually and hearing impaired. The 23-year-old will graduate with a degree in rehabilitation. Vernooy said Holler connects with fellow students by using his outstanding people skills and by not being afraid to reach out. Not able to attend commencement? You can watch the live stream of the event online at http://www.wright.edu/cats/technical/eventstream/.